A Family’s Greatest Sadness is our Greatest Fear. Click here to learn more about Macie from TheTruth365. When Bronwyn started treatment I had to sign off on all the chemo drugs used on her. One listed heart failure as a rare side effect. When Bronwyn drew the short straw on that one, only two weeks after her last treatment, we were stunned. In the months since I have learned much more about the treatments given to children and that heart failure is really not that rare. 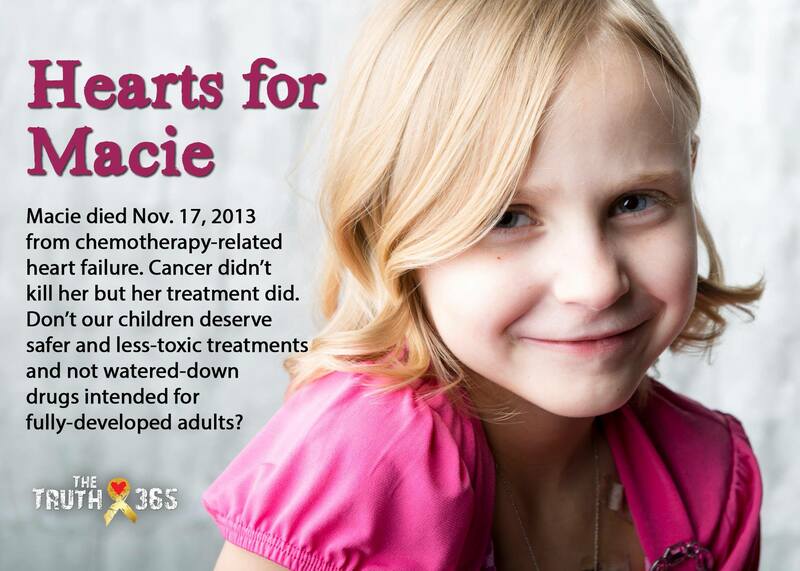 In fact, St. Jude’s discovered that heart issues are quite common in children treated with certain chemo drugs. Our hearts go out to Macie’s family. I never knew Macie or her family. In fact, I never heard of her before TheTruth365 posted this picture and Macie’s story today yet my heart is broken. I must confess it is hard to see stories like this and not be freaked out as well as destroyed. There is a mix of brokeness for the family of another child taken by heart failure due to chemo and stabbing fear that this actually happens. To really understand the cruelty of the treatment for childhood cancer that we accept as normal please click on the link and read the comments from other parents who have watched their child damaged by chemo suffer. It’s an eye opener. We need to find better treatments! This entry was posted in awareness and tagged cancer, cardiomyopathy, chemo, childhood cancer, childhood cancer awareness, heart failure, pediatric cancer, thetruth365 by GoldenCancerMom. Bookmark the permalink.